I always hate it when I fave to pay 50 cents, just to fill up my tires with air. 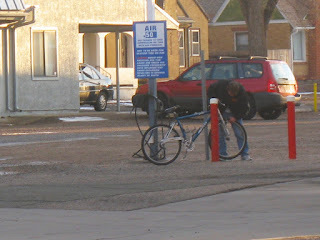 Well, the Dent Brothers Service Station on Abriendo and 4th Street doesn't charge bicyclists to use their pump! It would be nice to see other local businesses offering little benefits and incentives for people on their bicycles. Nice to know about the free air. There used to be free air places in town for automobiles, and I miss that much. I need to repair my bike pump that I also used to top off the auto tires too. One of my many unfinished projects. I have been pumping up the bike tires for free at great divide. They have an air system and a floor pump. It works well and I know exactly what pressure my tires are at.